If there’s one thing I miss since moving to the middle burbs, it’s the trams. Some people talk about public transport culture vs car culture. Car culture is where the default is to jump in the car to go anywhere. 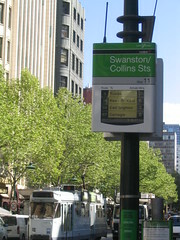 PT culture is where the default is to go to the local tram, train or bus stop. When I lived in the inner suburbs, the quality of the service meant there really was a PT culture. It was easy to catch PT to more places. Elsewhere it’s car culture. This is reflected in figures showing travel patterns, car ownership, and vulnerability to oil prices. Growing up in East St Kilda, the bus to Prahran and the city was at the door, the tram to St Kilda Beach was a block away, the train two blocks away. When I lived in Hawthorn, the tram to the city or Camberwell was at the end of the driveway. (The city-bound tram would screech around the corner, so you’d have a warning it was coming, despite not being able to see it.) There was a second tram route at the end of the street, a third about ten minutes walk away, and the station was about five minutes walk. When I lived in Glen Huntly, it was a three minute walk to the tram to Elsternwick and St Kilda, or an 8 minute walk to the station. I lived in other places too, but in the above cases, there was (reasonably) frequent, 7-day-a-week-until-late, easy to use public transport to shopping, work, the City, St Kilda, and most of the other places I wanted to go. I didn’t need a car (and for most of those years I didn’t have one.) That’s what makes a “public transport culture” — high quality services. When I moved to my current place in I couldn’t afford to buy in a suburb with trams and trains anywhere near where my family live. So I went for the next best thing — a zone 1 train suburb. So now I’m ten(ish) minutes walk from Bentleigh station — the train gives me north-south travel options, including into the city. But options in other directions are missing. The buses are there, but what’s key is that the level of service is vastly inferior to any tram — even though one of the buses is a Smartbus, and is better than many. I can get to work by train, and to a lot of shops and parks by walking. But I can’t easily get to Southland by PT, so I usually drive. I can’t easily go to the movies in Brighton by PT, so I drive. I can’t easily visit my mum or my sister by PT, so I drive. I can’t easily go to St Kilda Beach by PT, so I don’t often go anymore. We can’t have all of Melbourne criss-crossed by trams. But we should be able to at least have the Smartbuses upgraded to tram service levels (and beyond), and rolled-out across all suburbs, so that more trips are easier by PT. Sadly the government’s priority remains yet more roads, producing yet more traffic and yet more pollution. *Weekday: Monday to Thursday (3 more trams on Friday nights). Full route service times counted only, except 703 Sundays which counts all Bentleigh to Blackburn services, as none of them go to Brighton. ← Previous Previous post: How many people? I grew up in Hawthorn and noticed the same thing when I moved to Oakleigh. I’d rarely used a bus before I moved out here and I regret the absence of trams. They were just that much easier. Thank god for living in the inner city. PT must be upgraded in all areas, did anyone read an article in The Age on Monday on how disabled people and people in the outer suburbs have poor access to PT. The first stepping stone to good PT is timetable coordination and changes. On train lines there used to be an inner cirlce line and an outer circle line and there are still remains of tracks and land reservations (so why can’t we re-build those lines? ), but that was way back in 1917. There was a proposal to put trams down North Rd many decades ago but I haven’t been able to find the reason/excuse the idea was dropped, even after whole housing developments were sold on the back of the future tram route. Buses are (generally) crap. Even moreso the further you move from the CBD. We have one service here in Upwey where the first bus scoots past my house (stop very bearby) at 9am. This is *great* for commuters wanting to get the bus to the train station! Obviously when I need to head into town for work I make the 20-25 minute walk to the station. ‘The city-bound tram would screech around the corner’ Ha, the Power Street curve. Last time I was there, the trams were still screeching. It puzzles me as to why, when tram timetables were changed a few years ago, weekend daytime services were cut back from twelve minutes to fifteen, but only on a few lines, such as the 3, 5, 64 and 67. People with a tram service are quite privileged, for sure. I don’t think building a whole heap of new tram route is the solution, but the solution is to fix the buses to tram levels of service. “SmartBus” is an absolute joke. Southland is so bloody close to the Franga line – I was able to photograph a steel train from the back carpark! No idea why a station hasn’t been built, the rail line services some of the primary catchment areas for the shops so it is a certainty that it would be well used. Andrew: The daytime (including weekday) frequencies of those routes dropped to 15 minutes in the 90s. In December 2000 National Express upgraded the weekdays back to every 12 minutes, where they’ve sat ever since. The Greens plan to make PT culture more common, with their plan. I take it you’ve seen it Daniel? And my blog post on it? Not bad a critique, I must say. Yes, I’ve seen the plan, and your post Reuben. It’s not quite the plan I’d have produced, but they’ve done well to get it out there and get more discussion happening on the issues. Oh damn. Busted. Oh well…you can delete ‘Jim’s comment. I got lucky to live near 2 tram lines and a 12 minute walk to Windsor station and another tramline. Getting around without my car is easy. The downside is that while I can afford to rent here the price of a 1 bedroom aparment in the area is more than a very large home in the US. I should make notes Daniel. Of course you are correct. The nightmare too of a 15 minutes service on what was then the 69 route. Politicians should have been murdered. I have always thought 12 minutes was an odd frequency. No doubt there is an historical reason for it. I lived for a year near Hawksburn station. Not only was there the train, but three separate tram lines. I own an apartment in Deepdene which is about 2 minutes from the (now extended) Mont Albert tram line. I also lived at Mont Albert near the terminus for a few years – train and tram friendly. Buses are far nicer in Japan. The drivers will inevitably say thank you when you get off, and some will tell you to hold on while they’re turning left or right. And remind you not to leave your things behind when you get off. Still, they don’t beat a tram. Some Japanese cities (like Hiroshima and Sapporo) have trams, but they’re a dying breed here. The city I live used to have a tram line – closed in the 1960s I believe. We ARE getting a second subway line here (we have population of just over 1M) but I don’t think I’ll be here to see it open!